Such is the lot and genius of Jeanette Winterson. Her novels—mongrels of autobiography, myth, fantasy, and formal experimentation—evince a colossal stamina for self-scrutiny. In her new memoir, Why Be Happy When You Could Be Normal?, she returns to the source, her grim girlhood in a sooty English industrial town in the 1960s, to tell her story more forthrightly than she has before. But because this is Winterson, naturally she begins by taking a truncheon to the form. Winterson is the best kind of hero, deeply flawed, all swagger and pluck, and matched against an excellent villain. Mrs. Winterson (as the author refers to her parent) can confidently take her place among the demon mothers of life and literature, the Medeas and Mommie Dearests. She had adopted Jeanette “because she wanted a friend”—an enthusiasm that curdled quickly on the actual baby’s arrival. She stuffed the child in the coalhole, locked her out overnight in bitter winters. When she discovered Jeanette was having a love affair with a female friend, Mrs. Winterson arranged for an exorcism. “Unhappy families are conspiracies of silence,” Winterson writes, and the thrill she feels in breaking the contract gives these scenes a terrific energy. The pride of the survivor pumps into each sentence as Winterson hauls her old ogre of a mother into the light and ticks off every offense. “The one good thing about being shut in a coal-hole,” she writes, “is that it prompts reflection.” The bleak house became the crucible in which she brewed her own brawling instinct for self-preservation. She found sanctuary in the public library, reading through the collection alphabetically (“Thank God her last name was Austen . . .”), and her affection and attention to her surroundings pungently evoke life in Accrington, its squalor and dignity. The hungry children idling outside the dog-biscuit factory, hoping for scraps. The furry and mustachioed women—it simply didn’t occur to them to shave anything. The laborers who would end their days with a class on Shakespeare for self-improvement. It’s as proud and vivid a portrait of working-class life as any. If Winterson disappoints, it’s in her curious insistence on ascribing the development of her style to actual incidents in her life. To wit: She traces her preference for the fragment to when her mother found and burned Jeanette’s secret stash of paperbacks. The next morning Winterson was left to sift through the “burnt jigsaws” from her books. She writes, “It is probably why I write as I do—collecting the scraps, uncertain of continuous narrative.” Aiming for narrative tidiness tends to dilute this memoir’s delightfully unorthodox quality. But for the most part, this bullet of a book is charged with risk, dark mirth, hard-won self-knowledge. When Winterson writes, “I knew how words worked in the way that some boys knew how engines worked,” she’s right. You’re in the hands of a master builder who has remixed the memoir into a work of terror and beauty. 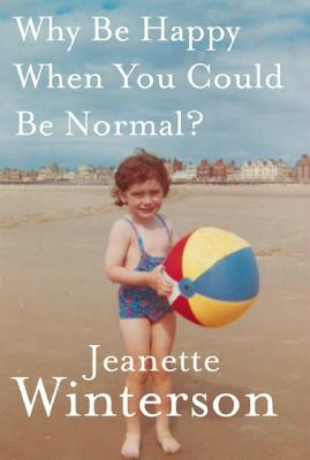 Tagged Accrington, Jeanette Winterson, memoir, review of Why Be Happy When You Could Be Normal?, Why Be Happy When You Could Be Normal?